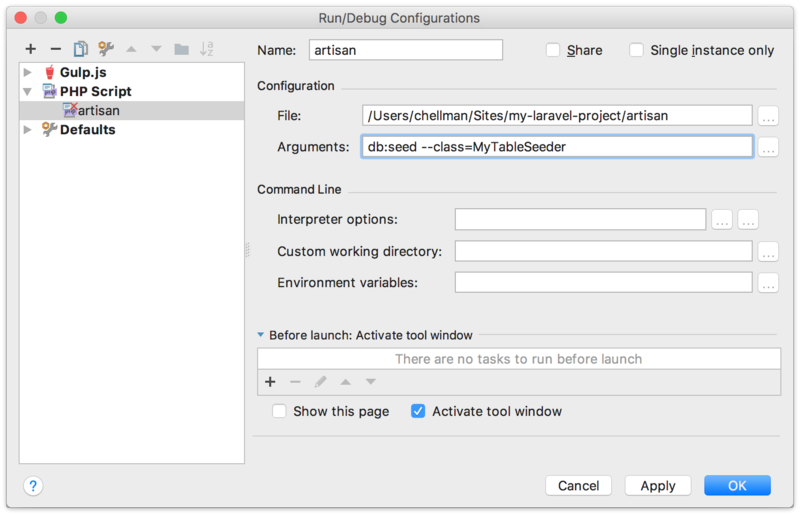 Working for years with Drupal's command-line tool drush, and more recently with Laravel's artisan, I've had occasion to interface with Xdebug in my favorite IDE, PhpStorm. Here's how I am currently working with all of these tools together. Here's how this will work: you'll do some initial configuration in PhpStorm and your local web stack, set a breakpoint somewhere in your code, then run your command line script from within PhpStorm. If all goes well, execution will stop at the breakpoint and you'll be off to the debugging races. If you use Drupal on any kind of regular basis, Drush is your friend. It's a command-line utility available for all platforms (including Windows as of version 5!) that can do sometimes-seemingly innumerable tasks for you. I've been using it for installing, enabling, and disabling modules and themes; clearing the Drupal cache; and running code and database updates for years now, but that's just scratching the surface.